On this day when the Keeneland dirt surface was a speed haven, Vekoma took every advantage of it pressing Somelikeithotbrown throughout before easily dispensing of that one and holding off the late-charging Win Win Win for the big win. Give extra credit to Win Win Win finishing 2nd against the bias. Signalman will continue to sit under the radar heading into the Kentucky Derby, as he ran another decent effort to finish 3rd which puts him on the same pattern that led to a big move forward in the Breeders’ Cup Juvenile last fall. 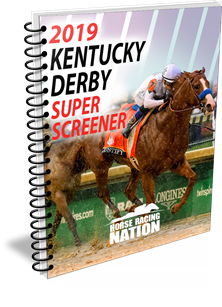 The Super Screener Top Long Shot pick, Sir Winston, had no shot on this day with the way the track was playing… move him up if he gets to a fair playing surface with a strong pace up front. Looking for the most impressive prep victory on the day? Look no further than the effort submitted by the Super Screener Top Board Hitter pick, Tacitus. Twice he had to check hard and lose position and momentum in the early stages of the race, but he showed a ton of courage overcoming that adversity to run on and win rather convincingly. This was the perfect prep for any horse looking to win the Kentucky Derby, as it was a good simulation of the crowded, traffic jamming conditions that the contenders will encounter on the first Saturday in May. From a Super Screener perspective, this was the top prep race performance to date. #2 Tacitus – Top Board Hitter/Closer – Will sit about 8 to 10 lengths off the leaders in the early going and will still be 6 lengths back heading into the stretch but will be one of the swiftest movers passing a lot of tired horses down the stretch…the only question is…how many? Has a solid choice to hit the board but definitely use some in the win spot. Offers no value this time around. Stay close to Haikal as he ran another good race here. He is pace dependent, but he is answering questions about his ability to get the Kentucky Derby distance. He is shaping up to be one of those dark horses that will go off at odds of 20-1 or higher in the Derby but with an excellent shot to hit the board at that big price. Do note that Final Jeopardy, Outshine and Overdeliver were all taken out of this race at the start due to severe traffic issues. Put a line through this race for each of these rivals. Final Jeopardy, a Super Screener Top Win and Top Value play, was particularly impressive as he took the worst of it yet showed some heart in gathering himself up again to close for a good 6th place finish. He along with Haikal were keys to suggested wagers. If anyone was listening to Bob Baffert, he was most high on Roadster last summer, but then a throat problem resulted in a surgery that took him to the sidelines for several months. His 2019 debut was impressive, and his win here even more so. Like the way Smith took him way back heading into the turn and then came on wide, gobbling up ground with every stride, earning his way into the Derby and as a top win contender to boot. Really strong effort here. Game Winner ran his usual good race and was intentionally taken wide to help him get more out of this prep race on the way to a peak effort on the first Saturday in May. He lugged in during the stretch drive, which was the only concern. Note how Rosario, who was riding Game Winner, glanced over to see how his stablemate was doing as they were approaching the wire, and when he saw him coming, he wrapped up on Game Winner to ensure that win for Roadster. The big disappointment here was with Instagrand. He had absolutely no excuses as he controlled a very modest pace, but just wasn’t good enough and confirmed that the Derby distance may be too much for him. Suddenly, we are down to one more weekend of preps with the center of focus falling on the Arkansas Derby with Improbable headlining that race seeking to snare those needed Derby points which appears he will secure without a problem. Other horses that are sitting in the 30- point area will be seeking to garner more points in either the Arkansas Derby or Lexington Stakes in hopes to get off the bubble and get firmly in the Derby gate.